Nako village is India’s best kept secret! This dream like village from another time is located right next to the Tibetan border, above 3600 m above sea level altitude, in the Himalayan highlands of the Kinnaur district, Himachal Pradesh region. You might recall my latest Himalaya post, which is all about our recent road trip form Goa to the highest mountain range in the world and you will remember my newest 45 minute long video drive and article all around the dreamy Kinnaur passes and tight roads. 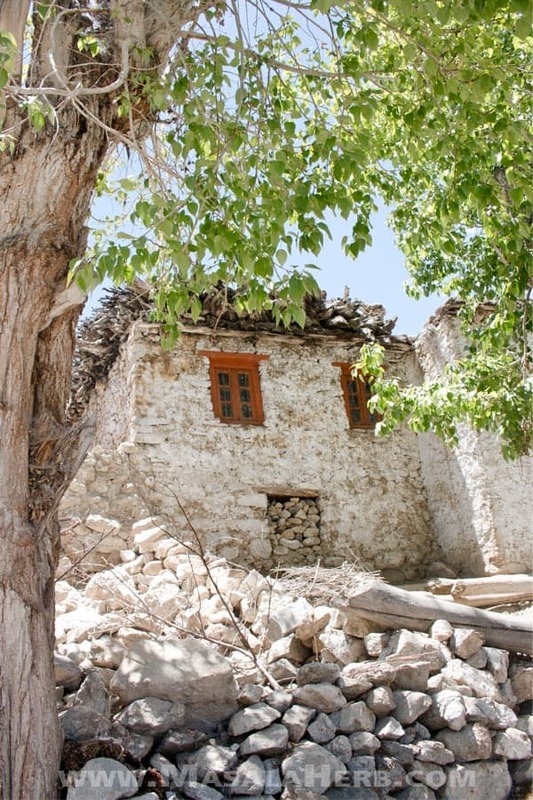 Nako is the last point of the Kinnaur district if you travel from Sarahan to Spiti Valley and this quaint village is also the most remote village. In fact it’s that remote that you can’t expect any mobile range during the day and Internet is still a huge commodity! Yet, I fell in love with Nako village, from head to toe, so that we even ended up staying one more day there then what we had initially planned. 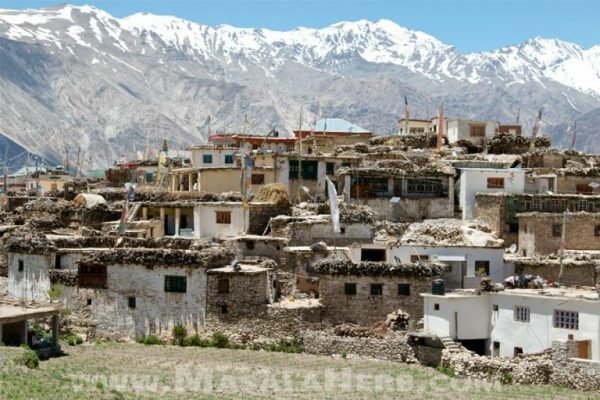 Most visitors come to Nako in the afternoon or evening to stay over for a night before moving on to either direction Kinnaur or to go to Tabo village. A many don’t even stop by Nako! The reason for that I think is because the village is really small, so besides the Tibetan Buddhist monastery aka Gompa, the old village part and the lake, there isn’t much more to do. A lot of people, foreign visitors such as Israelis etc with Taxi and passionate Enfield riders, tend to aim for the other more prominent Gompas in Spiti valley so their drivers usually take them to Nako for a night and the rest of the 7 days the time is spend staying 1-2 nights in other villages such as Tabo and Dhankar. The younger Indian generation come late in the evening with a wham and leave the next day in the late morning. Indian families with 2-3 buses pass by during the day to take a peak into the Gompa but move on quickly to the next village. So, Nako village is literally empty from 11 am to 3 pm! During that time you can hang out with the locals and make friends. The village is quite and in fact it reminded me of the days when the villages in south France were empty,… a 20 years ago. 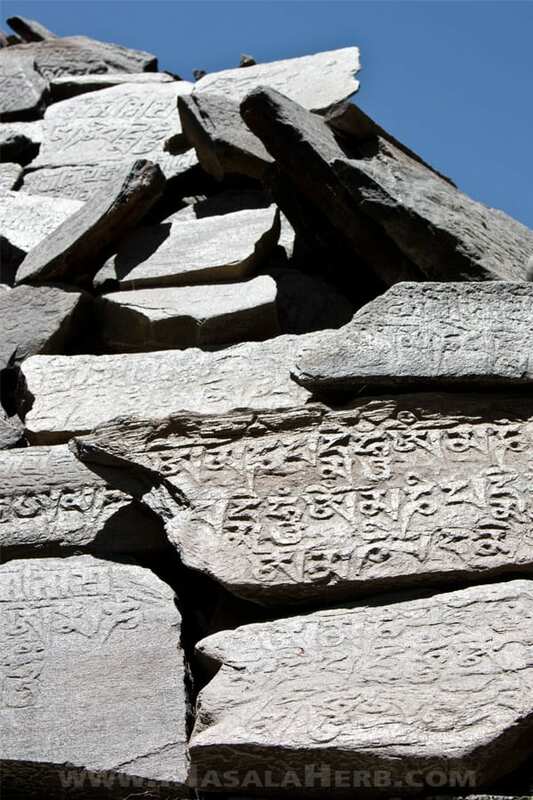 Visiting the 11th century Gompa Buddhist Monastery is the main reason for Pilgrims & spiritual/culturally interest visitors to visit Nako.. 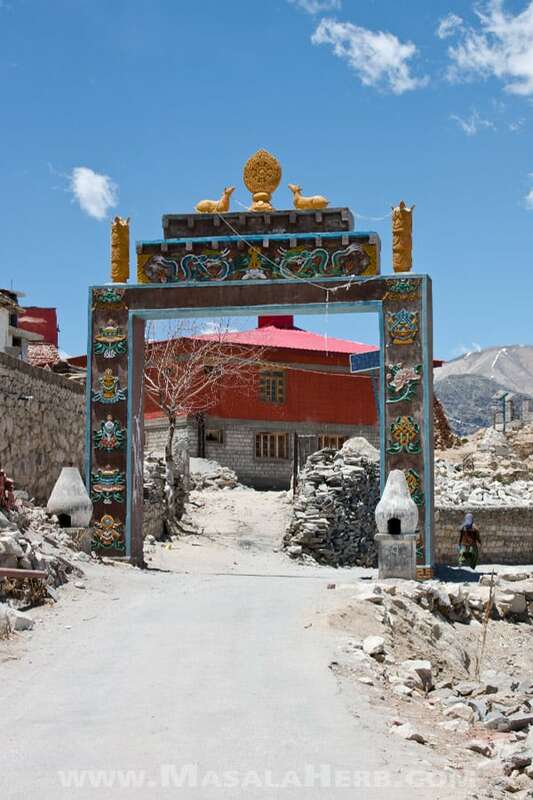 The Tibetan monastery is located next to the old village houses and you can’t really miss it with the huge colorful gate. It’s the building in red. You can visit the monastery but be aware that you must remove your shoes before going in and you can’t take pictures! I really took a while to find the lake but if you do, it’s for sure a lovely and quite relaxing sight with the village and the Himalayan mountain range as a backdrop. You can walk around, on the hills and around small path ways. However, be aware that you are at 3600 m altitude and that eventually you might get headaches etc due to the lack of oxygen. Also during the day the sun hits down a lot and it gets really hot(even in end of May!). The area does not have trees, and no trees no shade my friends! The moment you are in the shade, make sure to wear jackets, thick socks and a cap, it gets quickly very chilly in Nako! Locals cultivate mostly green peas in these areas, besides barley and beans. You will notice the smart irrigation system coming from the barren mountains. Nako very rarely receives rainfall, so locals learned to store water in the lake after the big snow melt every year again and that’s how they handle their field cultivation is these arid lands successfully. 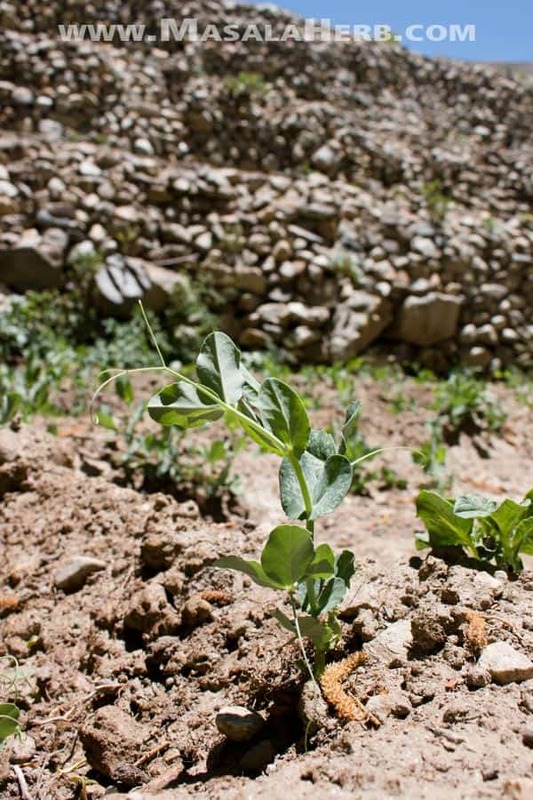 If you are interested to read more about the traditional agricultural cultivation in these areas, then you might want to check out this article from Life in Spiti, which is intriguingly insightful. Yes, we did stay longer in Nako, mostly because we needed a rest. However, I was fixed on getting this special but rare feeling again. The feeling of having traveled back in time again. It’s priceless and Nako gave me exactly that! Nako is not completely out of the world, for sure there are villages in India where you won’t even get a bottle of water. In Nako you get all kinds of amenities, so in that sense, it’s not that remote. Internet – forget being connected! phone connection – some locals say they do get a good mobile connection in the night at 1 am with the BSNL network. I know this is true because I stayed in contact with a friend there and she would write back to me at the earliest at 1 am in the morning. Forget phone booths too, there was non-working. Calling abroad is not an option at this point. Doctor – don’t get sick! We saw something like a “Medical treatment center”next to the Gompa but they might be able to help you with minor health issues only. Rent a bike – not seen anything like this there but most probably if you would talk to some locals, somebody might want to strike a deal. Continues electricity supply – Most of the time you will be standing in the dark, my friend! Whenever you get a chance to charge your phone, camera, and laptop, just do it! International food – yes popular, and outrageously delicious food dhabas (restaurant) such as the Lovon Guesthouse serve dishes such as Shakshuka and Falafel! Ok, you are right that’s more Israeli then international, but hey you get something else then just Momos, noodles and daal at the a** of the world!It didn’t matter to me because I was completely absorbed by the Momos and homemade Thukpa and Thantuk dishes! There are a couple of small shops there so you can buy all kinds of things from daily stuff such as soap, shampoo to souvenirs, to Chinese/Tibetan crockery, to meditative things. Heck, if you want, you can even buy trekking shows in your size! I bought so many things from Nako including a huge singing bowl, bowl sets, cups, incense, wall hangings, socks, caps,…That’s the advantage of traveling by car! The women run the village! You will mostly meat ladies when dealing with rooms, food, and items to buy.The women, from children to old age are the ones who handle everything. You negotiate with them the rates and they will sell you what they have. You will also see the women doing the other things what women always do such as cooking, doing the field work and cleaning up.Although it depends on the family too because for example, I saw that the whole family was working together in the Lovon guesthouse. They were chopping vegetables at 6 am and cooking dishes at 11 pm, the wife the husband the young daughter. All of them were cleaning up the rooms too. You usually (knock on wood) always get hot water (as long as there is electricity) and water in general there! They have huge old geezers, which full fill the purpose very well. Nako is environmentally conscious. Roadside garbage bins and “Keep Nako Clean and Green” signboards are common in Nako. The locals use solar energy a lot with their solar panels. ALtough Nako is still facing environmental issues as this article by the World Wide Fund for Nature conservation points out. How to get to Nako? The only way to get to Nako is by road. That means you can either get there via a driver or if you are a Royal Enfield daredevil then of course with your beloved bullet or the more unusual nerve-racking way, by bus. You won’t believe but I met way too many people who traveled by bus from Reckeon Peo to Nako. They were scared to the bone and of course the comfort level is low, however, they would do it again, they said. If you take the bus, make sure not to forget to get your inner line permit (for foreigners) in Reckeon Peo or Kaza because Nako is in the more sensible Indian border terrain and don’t miss your bus because the bus only stops by once a day! That means the bus station is 10 minutes walk from the town and in the day it really gets hot. There is no fixed timing for the bus to pass by, it would be impossible anyway with these roads. So, some people do end up waiting there for hours for the bus to come by. That’s why maybe you might want to look out for other travelers to hire a car with driver because then it’s worth it. We traveled by car with our Goan car and I was glad for that because I got to shop a couple of boxes of unique things and I was able to store that safely in the car. When to visit Nako village? We were in Nako beginning June but I think you can travel there in May too, it depends on the roads and if they are clear and open. I was told that the last visitors come by end of August. 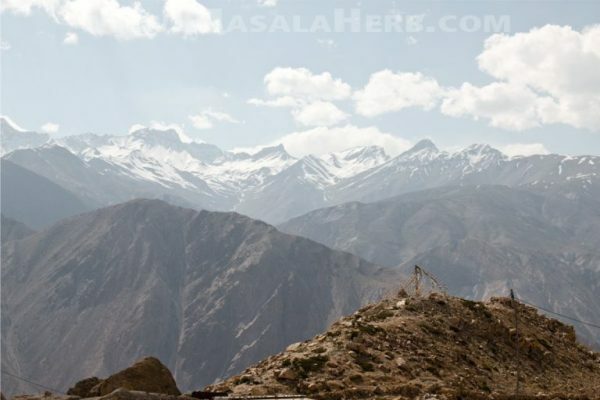 You need to consider that one roadway, the kunzum pass glacier from Nako to Manali, closes in mid-August, so there is only a limited time in the year where you can travel the whole round from Sarahan, Kalpa, Nako, further to Tabo, Dhankar, Kaza Kunzum and back to Manali. My point is, if you have traveled so far to see these parts, then you might want to experience the change between Kinnaur, Spiti and Lahaul valley and the breathtaking landscapes. So best is to come when the Kunzum is about to open and in 2017 when we visited Kinnaur and Spiti, it was the end of May/beginning June. Here is something which nobody will tell you! The room rates are lower when the Kunzum is not opened yet and there are fewer people around because the pass is still closed and most tourists don’t see the point of taking the Kinnaur road. But then you want to pass the glacier pass too at some point so to go back to Manali! So, by the time you reach Kaza, a few days later, the glacier road will be opened and you don’t have to go all the way back to Kinnaur and you can experience the Lord of the rings kind of landscape with roads turning into rivers because of the melting snows! That is why end May/beginning June is the best time to visit Nako! Where to stay in Nako? We stayed in the Lovon guesthouse (the location is wrong in google maps) which is right at the beginning, in the new part of the village. I wouldn’t recommend any other place. The owners are great and hard working, the drivers stop there too with their travelers. The food is divine and even locals come to eat there. The rooms are clean and neat and you get the most perfect view. Plus point is the big parking space! Where is the Nako lake? That you can see on the map 🙂 Just follow the signs to the moon lake guesthouse to reach the Nako lake so that you start walking westwards and at that point, you will be overlooking the village and see the lake as well. Another trick is to follow the irrigation system, you can’t miss it! Where to eat in Nako? Besides the amazing Lovon dhaba guesthouse there are at least 3 more such food places. I don’t know how popular the others are, we found the diamond with the Lovon so we didn’t go to venture out anywhere else. 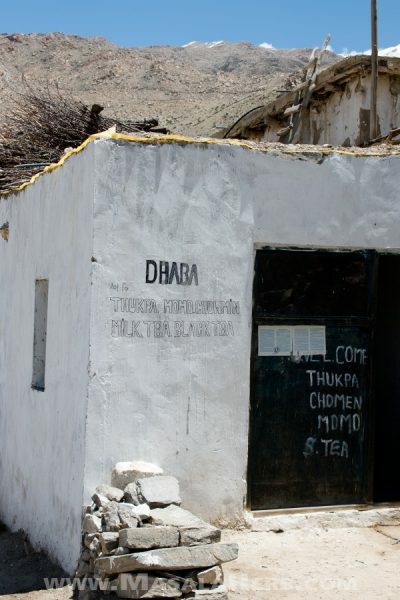 The dhaba in the picture is one of those other dhabas. In the Lovon guesthouse/dhaba I can recommend the homemade Thentuk (handmade pressed noodles in soup) and Thukpa (hakka noodle soup), they will warm you up. They make amazing Potato Momos too (steamed dumplings)! I never knew that Potato Momos were a thing before that. Turns out that’s the real deal! Otherwise, you always get the popular Indo/Chinese dishes such as Veg Chow Mein, and as mentioned further above, some of the “Western” food. 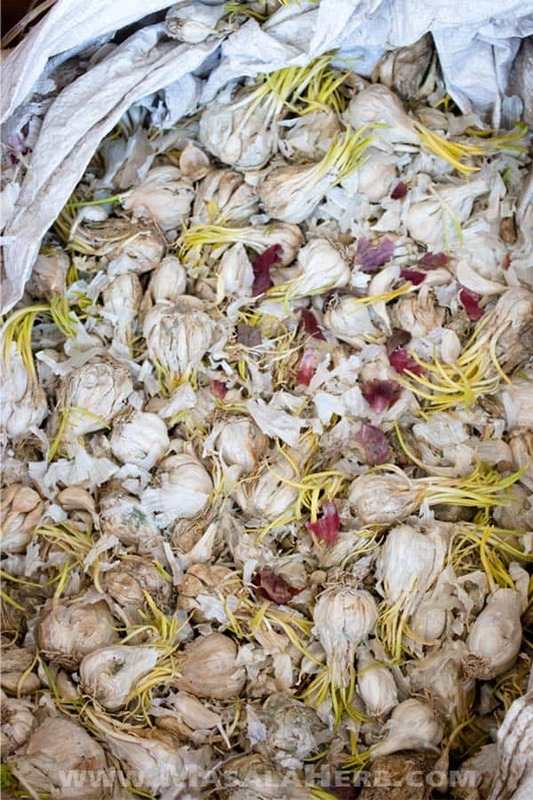 Certain ingredients are hard to get for the locals so at times they feel shy to say why they can’t make a lemon tea (because they are out of lemons) and in fact, they are a bit embarrassed because they are afraid that the visitor might not take it well. I saw some Indian couple miss behaving that way… which was truly inappropriate. Nako is a simple village, with donkeys standing around and hard working locals. I wish for Nako that it remains the way it is with its unique charm and that hotels and luxury abodes do not start to appear randomly because this would be one of the saddest things that could happen to this sacred corner in this world. 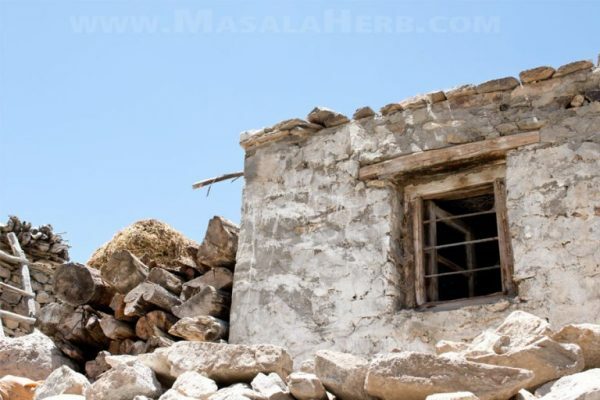 Dear Reader, are you planning to visit Nako village any time soon? I stayed in a tented accommodation just above Nako Lake. We could see the lake as soon as we stepped out of our tents. I loved walking around Nako village. Did you meet the Nako Youth Club guys – they conduct village walks and hikes from Nako. I did the village walk with them. The murals in the monastery are simply beautiful although they did not really allow me to take pictures. Legends, myths and stories of Nako are really interesting. Love the detail of this post Helene! I have a friend in New Delhi who named his website “Kunzum” for the pass and now, thanks to you, I know more about the nearby region. This further seals the fact of all the places in the world, we HAVE to get to India and soon, to experience the depth of culture and steps back in time you describe here. This seems like a lovely place to be in the Himachal. I loved our recent trip to Manali. The life is slower paced and calm. This pretty much looks the same. It makes me want to travel so bad again. What a beautiful place it is. I like how peaceful and serene it looks, the views and the scenery is so amazing. I would love to visit it someday although I have been to the Kinnaur district few times and few places in Himachal Pradesh, Manali and Shimla being the top ones but this more of custom and traditional Nako Village looks great. Thank you for sharing. Awesome place, i love the gate it looks awesome with the stuff in the top and the sides :)). It makes me want to go back in India. Nako village is such a beautiful place to visit. The pleasant and peaceful ambiance of this place is so amazing and fulfilling. It’s on my bucket list now. Just waiting for my kids to grow up. I will tell you that I am always amazed to see how other parts of the world live. These people who appear to live in what we would call hovels are truly rich in life. This post warms my heart! It is on my bucket list to trek to Everest base camp. I love the allure of the Himalayas and the people and villages there. The place looks amazing, I would love to visit there! Cozy and beautiful vibes. India looks amazing! It’s definitely on my bucket list of places I want to go! Nako village looks like a paradise! Your pictures and video speak for itself how splendid it is! I love hidden gems like this! What a picturesque town. And peas are one of my favourite foods too! This looks like such an amazing place to visit. Those photos are stunning. And that mountain view, wow! This seems like a awesome village to visit, I have never been to India before though but this wants to make me visit. If I eventually visit India, i will surely visit the Nako village. Wow, what a beautiful place full of amazing culture. The food, the pictures were truly breathtaking. I would love to see this place. I never knew about Nako! Yet I love the fact that most of the times it’s empty and that it’s not full of tourists! I’ll have to add it to our bucket list! Nako village looks like such a unique and interesting part of the world, completely disconnected. I can see how you wouldn’t want to injure yourself up there. It really is isolated. Love that you got to see how the locals really live their daily lives, harvest food up on those mountain tops. Wow those views! I love those mountains. I’m sure the pictures are not doing this place justice! I’ve always wondered about India. I haven’t been but have heard so many beautiful things. Such a beautiful place of which I had never heard. I love the peace and quiet, but I like to explore. Are there safe areas to hike and explore the surrounding countryside? That is something I would need to ask some people first because it’s a sensitive area as it’s right next to the Chinese border and to the contrary to what you know, china and India are not friends and in fact the border disputes are still active. Also, you can get altitude sick easily with stinging headaches and loss of oxygen. There are people who take pills for that but I didn’t do that. Best is if you hire a guide and you go tracking. A guide will tell you where it makes sense to go and where not. These guides also organize everything with stopovers in local houses where food is provided and shelter. When you go tracking in those parts you move between a lot of no-mans land and the villages are scarce. Some have barely 50 inhabitants. We met other folks from Canada, Spain etc who had hired a guide from the area to get around. These guides are properly trained. However we met these trekkers in Spiti valley and not near Nako or Kinnaur. What a great post, how lovely to see so much focus on this small village that seems to be a minor diversion for most visitors, who rush through rather than enjoying what it has to offer. I like that you took more time to relax there, to interact with locals, and to record your photographs of the peaceful village. Definitely one to bookmark! This place looks so peaceful place. It is so simple but i think everyone unites. I hope i can visit here. Nako village seems like a charming place to just relax and immerse oneself in the local culture, the fact that it is relatively empty during the day is great. Would love to spend a couple of days here. I am also wanting to taste the Potato Momo, never knew about the existence of this variant. Tibetian butter tea…tell me more! That sounds awesome. Nako is a gorgeous village. I love historic villages like this. The first photo with the snow capped mountains is stunning! What an amazing place! Nako seems to be the perfect place for quality rest, as you said. No internet. No cell phone. Enjoy the days without unnecessary connections. Thanks a lot for the share. I would like to visit Nako and other Himachal villages once as they are able to refresh our mind. I was going through your article. It is really fantastic and moving. so i decided try Nako nex summer. 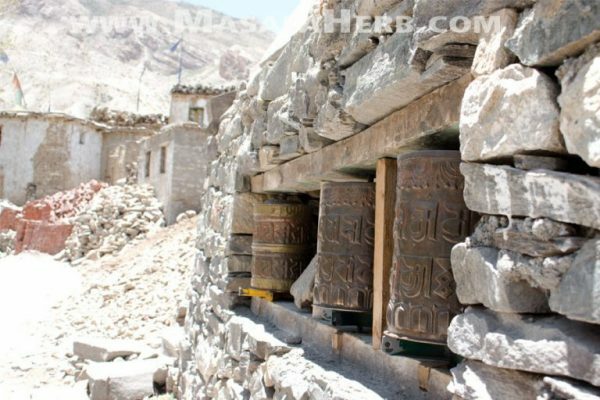 Hi, this may be interesting you: Nako - A Dream Village in the Himalayas - Kinnaur Himachal Pradesh India!